Please indicate any dietary restrictions not found above. Your registration is not complete. To reserve your seat, please click here to pay through PayPal. 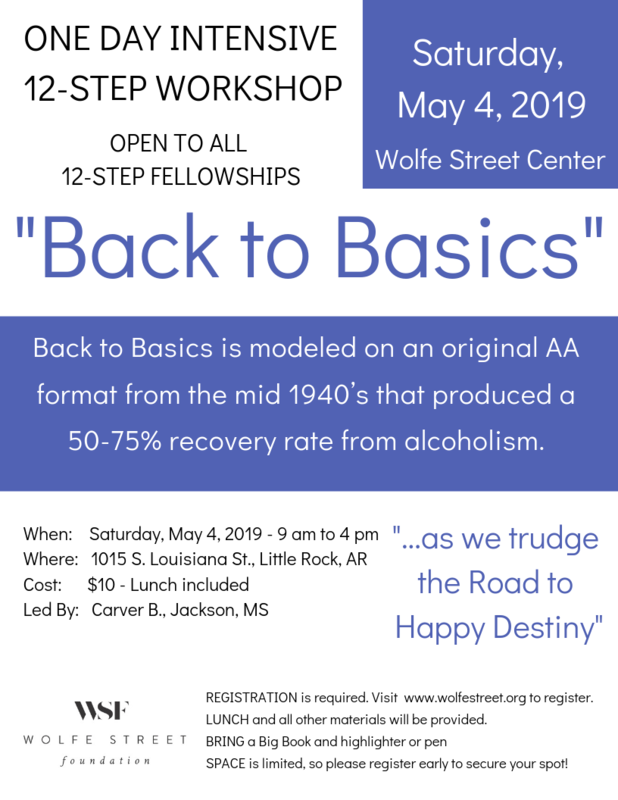 Formatted by Wally P., an Alcoholics Anonymous Archivist from Tucson, Arizona, “Back to Basics” is a reenactment of a 1940’s AA Beginners Meeting where participants are guided through all 12 steps in Four One-Hour sessions. Originally presented over the course of four weekends, “Back to Basics” is, in this presentation, delivered in one day, beginning at 9:30 AM, going through lunch. This provides the attendees time to complete a gentle Assets and Liabilities inventory and share this with a sharing partner. The program usually concludes around 3:30 PM. “Back to Basics” gently shows how the steps link together. It has proven to be a powerful tool for Newcomers and Experienced 12-Steppers alike. It provides an opportunity to actually make commitment decisions which re-energize an existing 12-step recovery program or forms the basis for beginning a journey of recovery. Carver B. of Jackson, MS discovered Back to Basics in 2008 on a site visit to the Betty Ford Center in Palm Springs, CA. There Carver leaned that “Back to Basics” had transformed and re-energized the Betty Ford Center Alumni Program and has committed to providing the program throughout the United States as a public service to the Recovery Communities they serve. Since then Carver has taken over 7,000 men and women through the 12 Steps. Since 1997, by word of mouth, “Back to Basics” workshops, Beginners’ Meetings and Groups have spread throughout the United States and across the globe. The program has become a very effect means of providing a “program of action” to aid in the recovery of thousands. The response from attendees has been overwhelmingly positive for young and old in recover, alike. Carver B. is dynamic facilitator in every sense. We hope you can join us as we “trudge the Road of Happy Destiny”.